Before there was Buffy the Vampire Slayer, before Angel, before True Blood, before the Vampire Diaries (or The Originals), and yes, before Twilight, there was a little known mainstream television show developed by Aaron Spelling and John Leekley that was painfully short-lived. A total of only 8 episodes saw the light of our T.V. sets. In April of 1996 the show had its debut performance. That show was Kindred: The Embraced. 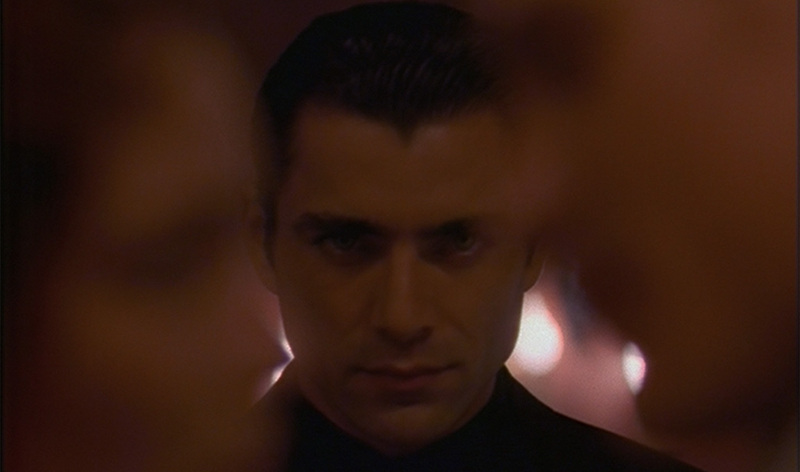 Very loosely based on the White Wolf RPG game “Vampire, The Masquerade”, the series focuses on the “Prince of the City” Julian Luna, a leader of five clans of vampires that survive through disguising themselves as humans and living by a strict set of laws designed to protect their true nature from being discovered. They call it ” the masquerade”. Kindred was special. It’s one of the few shows that I would beg someone to remake, to complete what was started, to fill the void left by an unfinished story. Popular rumor, or myth, is that the show was cancelled due to the tragic death of Mark Frankel, one of the leading actors on the show that played the charismatic Julian Luna. The truth is, the cancellation took place months before. The cult following Kindred created did spark the Showtime Network into talks to revive it , but, shortly after that the motorcycle accident that took Frankel from us happened and any hopes for a return of the show left with him. Everyone at the time who loved the show agreed that no one could replace Frankel as Julian. It would have been like trying to replace Sarah Michelle Gellar as Buffy. It couldn’t be done. In my mind there would have been no way to replace any of the actors. (Especially Frankel.) They played their roles well and each one fit almost too perfectly into them. The series did make some mistakes in my eyes by giving away too much, too soon, like revealing the clans within the first episode, and while the different clans were never a secret, I always felt that if someone were getting to know the White Wolf world of Vampire the Masquerade for the first time, through this series, or one like it, that it would be nice to seduce them into it, not just drop them into it. Give the clan development some breathing room, and allow the audience to explore and discover things in time. That’s part of the fun of new things isn’t it? That discovery, that reveal. Even the relationships moved too fast, and were too deep, too soon. Cash and Sasha’s relationship was the biggest example of that. They needed to let things play out more naturally. Still, the show was, in my eyes, fantastic, and will always be on the top of my lists of shows I wish were still around. Seventeen years have passed since Kindred first aired. So maybe it’s time now. Maybe now even the most devout fans would be willing to allow another actor to step into Julian’s skin and breathe life into him once again. You can read more about the show here on our page, or better yet, get a copy, watch the show and let us know what you think. Is it one you’d love to seem re-imagined? After all – “we’re all around you”. Image courtesy of Republic Pictures. I I totally loved the show. It should indeed make a return, and as it was said, take the time to develope the series furthur. This would indeed be an awesome show to see come back to life. The issue would be finding a cast that would give this series the life it had EVERYONE was perfect in the roles they were cast into it was as though they wanted to be the characters they portrayed. Hi, this is very good an article. I like Kindred the Embraced very much. When I was teens I was crazy about Daedalos. 😉 Becouse of his “gentle soul”. Yesterday I watched 4 parts from the show. And you know what:? I still like it very much. I am sorry that Mr Frankel died. But life is go on and may be KtE need the new prince? By the way these all movies which you mentioned are realy funny… Kindred the Embraced has has elegance and class and mistery. I hope that Kindred the Embraced will come back one day. This show was amazing and could come back at any time thanks to the Daedalus:last will being a set up for a continuation. Somebody make it happen! I’m even making a short fan film based on the WoD. I’m watching the show now. I honestly would love for it to be recreated. I think it is amazing!!! Wouldn’t be same without Mark Frankel as Julian Luna. Podcast Episode 95: Ghostly Games and Ghastly Profits Goodbye Cult. I’ll never know what you meant to me.